https://tuinderlusten-jheronimusbosch.ntr.nl/en# Accompanied by medievalish music and sheep bleating. 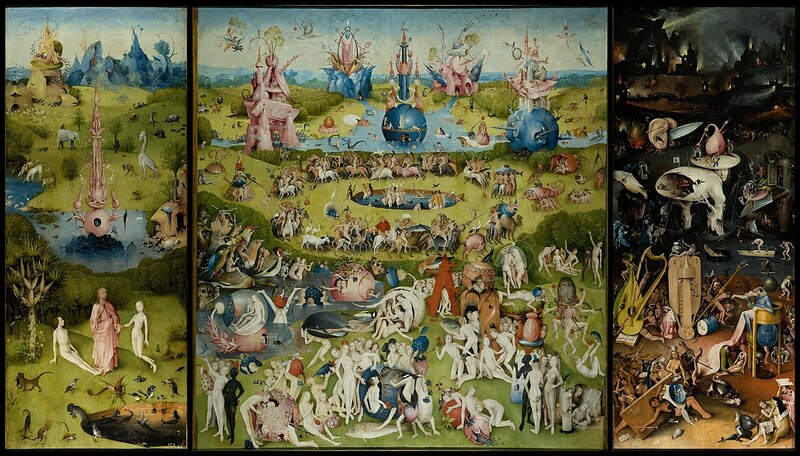 Bosch's Garden of Earthly Delights was (one) of the reasons I went to Madrid. The Garden is in the Prado and is just as stunning as the online projects show her to be. Plan to visit the painting in off hours as there is usually a crowd waiting to inspect it, and it is a delight. I spent several hours with and around the painting just breathing the molecules of paint flakes in the air, hoping to breathe in enough so it stays with me. Also worth a visit in Madrid are the Museo Nacional Centro de Arte Reina Sofía and the Thyssen-Bornemisza Museum. The Gasparini room in the Royal palace is also a pleasure visually. As I was writing the post I went to the Prado website and ... behold there is an Ingres exhibition. Ingres is better than Leonardo in complete drawings, I tell you. Now that with google you can travel pretty much anywhere in the world from your Saturday morning bed - take a trip through the beautiful and the intellectual and into this painting. Visit it in person if you can.